In today's vernacular, it would read "Come and get you some of this!" Differences between Texas and Mexico progressed from the talking stage to the shooting stage at The Battle of Gonzales, generally considered to be the first battle of the Texas Revolution. Leading up to the conflict, the Mexican authorities sent a force of about 100 men to repossess a cannon that had been provided the residents of Gonzales for defense against Indians. In response to the Mexican force, the Texans, under Colonels John H. Moore and J. W. E. Wallace, loaded the cannon with scrap iron, aimed at the Mexicans, and fired the shot that began the revolution. After a short fight, the Mexicans retreated, with one casualty, against no loss on the side of the Texans. 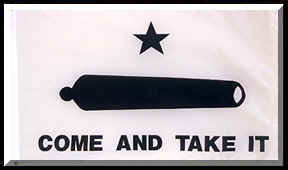 The battle flag used by the Texans at the Battle of Gonzales gained considerable recognition as the "Come and Take It" flag. On a white banner was a picture of the old cannon, painted in black. The flag acquired its name from the words "come and take it" printed below the cannon.